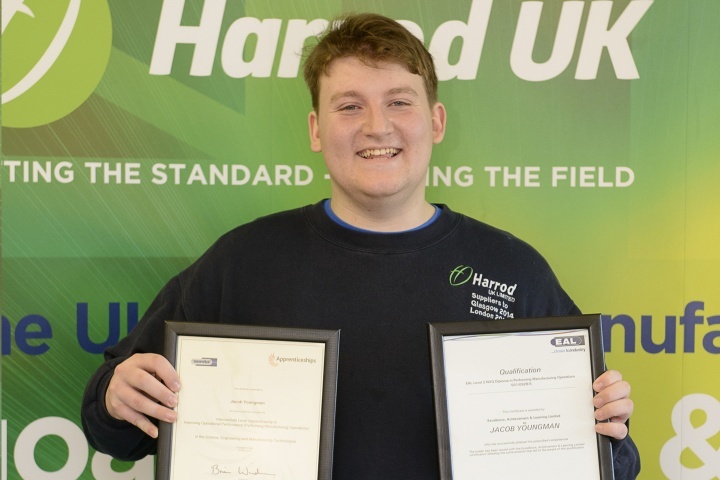 Success is in the air at Harrod UK for 20 year old employee Jacob Youngman who has just completed his level 2 apprenticeship Diploma in Performing Manufacturing Operations (National Vocational Qualification). Jacob joined Harrod UK on the 10th June 2013 starting in the warehouse, stores and finishing departments. After showing interest and promise he progressed onto working with the logistics team where he really knuckled down and got to grips with the company's 'Whatever it takes' motto ensuring full customer satisfaction, whilst applying the new skills he had gained to his apprenticeship programme. David Bowling, manufacturing director at Harrod UK comments "The benefits that apprentice schemes bring to our region are often underestimated; helping to rejuvenate East Anglia's growing manufacturing industry." According to the Department for Business, Innovation and Skills; over 6000 apprenticeships started in Suffolk in 2013 amongst them was 20 year old Jacob. David continues, "The opportunity for us to equip Jacob with a foundation in manufacturing and allow him to take his first step on the career ladder within his home town is rewarding." Having already completed his GCSE's in Maths English and IT at Benjamin Britten High School it was not necessary for him to take his Functional Skills (Maths, English & IT) module in order to achieve his qualification. Achieving his Level 2 Diploma and Technical Certificate will give him a great basis on which he can enhance his existing skills base through gradual progression within Harrod UK. 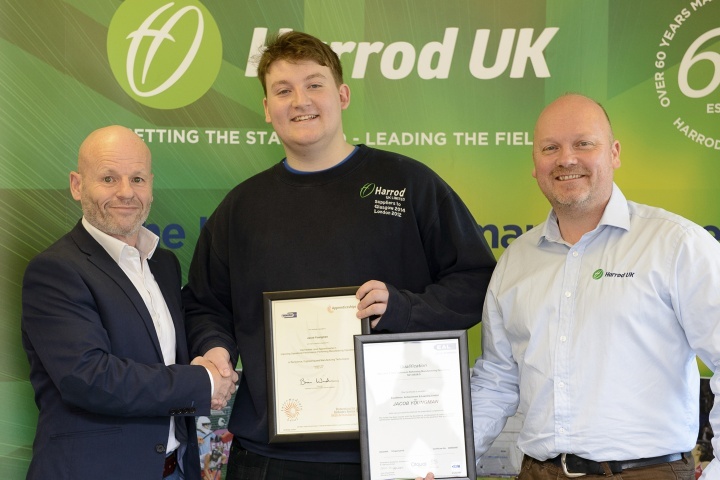 Manufacturing Director David Bowling and Logistics Manager Lee Mickleburgh from Harrod UK presenting Jacob with his Diploma and NVQ Level 2 certificates. Jacob said" Having Lived in Lowestoft all my life, I know these kinds of opportunities don't come up very often. Doing my apprenticeship with Harrod UK has given me the opportunity to build a Career and has helped me develop as a person and given me confidence. I now feel like I have a bright future ahead of me". Harrod UK currently employs 6 apprentices in a range of roles across the company all of which are working towards their final qualifications. The success of Jacob and others we hope will inspire more young people into the industry over the next few years, which is why we plan to develop a rolling apprenticeship programme. David explains "We are determined to grow our own talent by nurturing and investing in each of our employees, building a strong workforce for the future."